A series of activities are underway in Hanoi as part of the Green Living Festival in response to the action month for the environment and the World Environment Day (June 5). 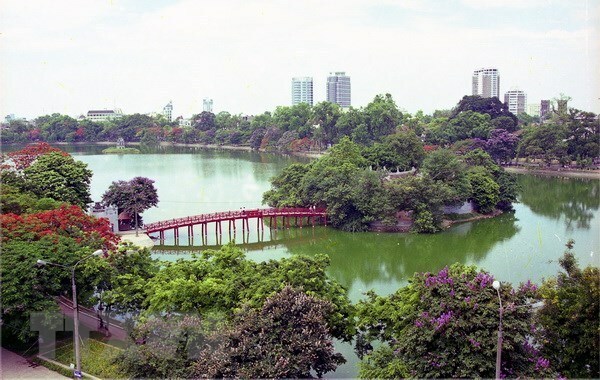 The festival is organised on June 1 and 2 by the municipal Department of Natural Resources and Environment, the People’s Committee of Hoan Kiem district, and Live and Learn Vietnam. More than 1,000 people, including representatives from the city’s departments, sectors, organisations, businesses and schools, are expected to take part in activities towards a green and sustainable Hanoi at this festival. An activity themed “What is happening to the environment in Hanoi?” features games providing information about environmental pollution, along with an exhibition of installation art works made from plastic straws, plastic bags and bottles. “Waste is a resource” introduces environmental groups and projects of young people such as exchanging wastepaper, used plastic bottles and electronic waste for environmentally friendly gifts. It also instructs how to have a green lifestyle and recycle products. Meanwhile, “Reducing nylon and plastics”, “Using clean energy” and “Sustainable consumption products” introduce young people and businesses’ green ideas to promote reducing, recycling and reusing waste, along with eco-friendly products like herbal skin and hair care products, chemical-free soap and shampoo, and bamboo or stainless steel straws. Street music performances are also set to be a special treat for participants in the festival. On June 5, a clean-up campaign will be launched in Tri Thuy commune of Phu Xuassyen district to clean the environment, dredge cannels, sort waste and plant trees. It is hoped to draw 500 local residents. These events are part of efforts to connect state managerial agencies with civil organisations, schools and businesses to encourage joint efforts to protect the environment and promote sustainable development.